These coaches are built around a 3D printed shell with plastic and brass detailing parts. British Rail converted several GWR non-corridor brake ends into auto-trailers. These, and a small number of pre-war GWR conversions had a distinctive 'flat' front very different to other autocoach stock. To complete this coach you will need a pair of Dapol autocoach bogies (available from DCC Supplies and Rails of Sheffield). British Rail modified a few GWR C.75 coaches, fitting them with through control gear so they could be used between a locomotive and an autocoach. To complete this kit you will need a pair of 9ft GWR bogies (eg Ultima UM576). Diagram A38/39/40-43 built by British Rail. This design was introduced by British Rail in 1954. They lasted in passenger use until 1964 when the auto-trains were replaced by diesel multiple units. Many went on to departmental use and several are preserved. Famous departmental examples include the A38 diagram Derby Research Liveried 'Test Car 1' now at the Midland Railway Centre. A pair of etched sides to convert the Dapol autocoach into the later diagram A38/39/40-43 style built by British Rail. Pair of white metal autocoach buffers for the driving end of a GWR autocoach. 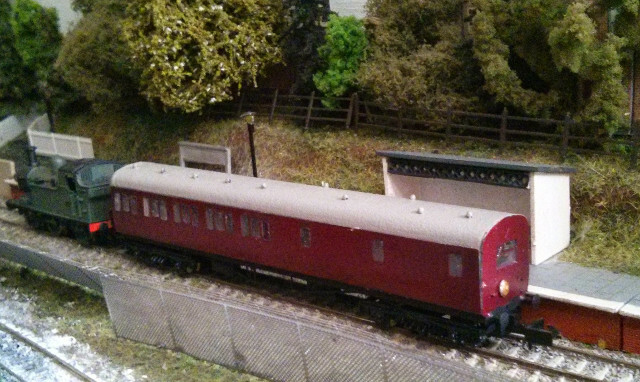 As used on our GWR autocoach kit. Pair of gongs for a GWR or BR/GWR autocoach.